On Wednesday 12 September, the European Parliament passed the report on the rule of law in Hungary, prepared by Dutch Green MEP Judith Sargentini. The report will trigger the Article 7 procedure against Hungary, making it the second country after Poland under the Article 7 procedure. The President of the European Parliament Antonio Tajani even threatened with further procedures, e.g. against Romania, Bulgaria and Malta. More than a week after the vote, it is time to take a look at the broader implications and consequences. Are Hungary and Poland so special? While Hungary and Poland are definitely not the only two EU countries that have been committing human rights violations and are going against the core values of the European Union as defined in Article 2 of the Treaty, the specificity of Hungary and Poland lies mainly in two factors. First, these countries were the champions of democracy and institution-building in the two decades following the transition in 1989-1990. But the champions of liberal democracy back then have become the champions of illiberal democracy now – and the pace of the deterioration is simply higher than in other Member States such as Bulgaria, Slovakia and Croatia. Second, while other countries usually try to hide their problems with democracy, these two countries are proud of them and have created an ideology around it, thus directly provoking the European Union and other politicians. These are the two countries where right-wing populism, or, as we prefer to call it, tribalism, with a strong authoritarian, ethnocentric character and a Manichean worldview, has become the most ideologically elaborated. And these are the two countries, where the systemic destruction of checks and balances is justified with ‘national interests’- pushing back the globalist and post-communist elites to strengthen national sovereignty. The Hungarian government makes no secret of its plans for centralisation, neither does the Polish. At the same time, governments in Slovakia, Bulgaria, Romania, while making some illiberal steps, do not make a public display of it. The specificity of the Hungarian and Polish case is that these governments are putting less effort in diluting the effect of their policies by means of diplomacy: on the contrary, their diplomats usually use the same argumentation as is used in domestic politics - this is especially true for Hungary. The big question is: how efficient are the measures proposed in the report? While we could observe some modest signs of moderation after the same verdict was passed on to Poland last year, and more willingness to compromise by the new Polish PM Mateusz Morawiecki, we do not believe that the same will happen in the case of Hungary. As a result of the vote, my colleagues and I at Political Capital Institute expect Orbán’s political agenda and policies will remain unchanged. After his third two-thirds victory in a row, Orbán’s willingness to reach compromises declined significantly. Hungarian domestic politics will not change, the elimination of the remaining independent media, the independence of courts, and the autonomy of universities and of civil society will continue unflinchingly. As a sign of this: despite pressure coming from either the United States and the European Union, Péter Szijjártó announced one day after the Sargentini vote that Hungary will not come to an agreement with the Central European University (CEU). Orbán is not expected to withdraw his decisions until there are European Court of Justice decisions dictating otherwise. Fidesz is going to use a more anti-Brussels tone than ever before in the upcoming EP election campaign, and will continue his threats against George Soros and his ‘agents’. Fidesz’s campaign messages will revolve around migration both domestically and on the European level, claiming that everybody who disagrees with Viktor Orbán and criticises his increasingly authoritarian and nepotistic political system – even if it is completely unrelated to migration – is ‘pro-immigration’ and commits treason. Migration is not important for Viktor Orbán as such neither is it relevant in order to maintain his popularity domestically, but because it allows him to gain more supporters in Europe and weaken, stop and reverse the integration process by blocking decisions and exploit divisions within the EU. The government has just started a similar public campaign against the Sargentini report and Judith Sargentini herself as against the ‘Soros plan’ and George Soros himself. And he will only turn up the volume when campaigning against those actors (NGO-s, opposition, governmental-critical media) that he sees as public enemies. As we wrote with Zsolt Enyedi: ‘Orbán and other past and present leaders like him in the region are party chiefs (and often party founders) who feel at home with democratic electoral contests. The others include Macedonia’s Nikola Gruevski, Montenegro’s Milo Đukanović, Poland’s Jaroslaw Kaczyński, Slovakia’s Robert Fico and Slovenia’s Janez Janša.’ Orbán is a political animal who loves campaigning, and he just happily exploits the opportunity to mobilise his voter base against his current enemies. Which parties are supportive of Orbán? The vote was an important moment of truth in the sense that it revealed who is with Orbán and who is not. It finally became crystal clear that Orbán’s main European constituency are the populist and far-right players, not the mainstream. It was clear already in the debate preceding the vote in the EP that Viktor Orbán’s main supporters are anti-EU and Eurosceptic parties, most of which are far-right forces promoting anti-EU and pro-Putin policies. Some of them, as the French Front National and UKIP, even invited Viktor Orbán as an ally in case Fidesz left the EPP. The real supporters of Viktor Orbán sit in the Eurosceptic ECR, the anti-EU EFDD (except the Five Star Movement) and the far-right ENF (see the figure below). It seems highly likely that – even though these groups will be reshuffled because of Brexit, which could even counterbalance the populist upsurge – Viktor Orbán’s political future lies with one of the successors of these formations due to the fact that the he is drifting further and further away from the EPP. At the same time, this would considerably deteriorate his political influence and it is almost impossible to imagine that a far-right, anti-EU, Eurosceptic party family can be united and compete with the EPP in the long-term. 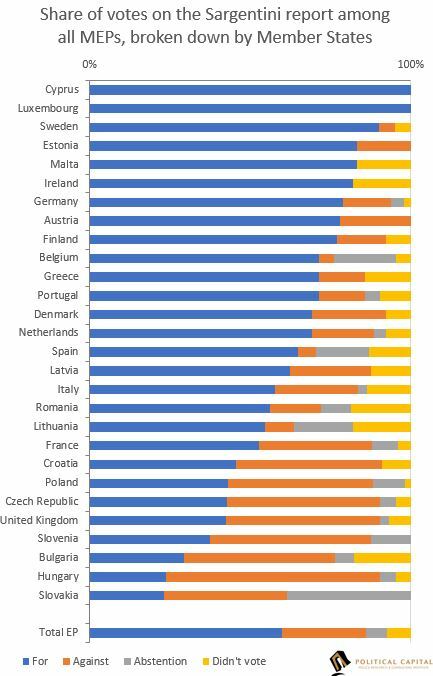 Although the European populist right is cooperating with increasing efficiency, it remains heterogeneous, and there are serious policy differences between them even on migration - see, for example, the widely different situation and interests of Italy and Hungary in the quota issue, and the conflicts between the Italian and Austrian governments. A piece of irony: the only major coalition party in the Eurosceptic group, the Five Star Movement, voted against Orbán as well (last year they abstained), unlike the Lega, which is the main supporter of Orbán. The Sargentini vote indicates the beginning of the end of Fidesz’s career within the EPP. We should expect a gradual rather than an immediate break-up. Voting behaviour indicates a clear shift from the vote last May, when the relative majority of EPP members still supported Orbán. Now, 58% of EPP members voted in favour of the Sargentini-report, 29% voted against and 14% of the group abstained. In last year’s vote on the state of the rule of law in Hungary these proportions were: 34%, 47% and 20%, respectively. Orbán lost some of his important former supporters and allies. Most importantly, Austrian Chancellor Sebastian Kurz decided to support the resolution (ÖVP abstained on the previous vote last May), and so did influential leaders within the EPP from Germany and France, such as Manfred Weber, Joseph Daul and Daniel Caspary. Manfred Weber, when detailing his position on the rule of law debate, tried to diminish the importance of the Article 7 procedure by picturing it as a ‘dialogue’, thus creating some room for a future solution. The vote also revealed that left-right division still matters in the European Union, not just the ‘populist-mainstream’ divide. The more right we go on the political spectrum, the higher the rejection of the Sargentini report was. While left-wing and liberal groups (GUE, Greens, S&D, ALDE) supported the resolution with over 80 percent, the most right wing group, Le Pen’s ENF, rejected it with 100%. East vs. west – still a valid division? If we break down the results of the vote according to countries, we can see that the east-west division (or new members - old members division) is still important. Most of the countries where MEPs mainly voted against the resolution (except for the UK) were new Member States: Slovakia, Bulgaria, Slovenia, Poland for example, but even Romania, a country with a historically tense relationship with Hungary. This can be explained with two main reasons: first, a different understanding of democracy, differing democratic traditions and a different past within the European Union create a Central Eastern European solidarity. Second, so does the fear of a new Article 7 procedure against other countries. Slovakia and Romania, for example, together with Malta, were explicitly mentioned by Antonio Tajani as next possible targets of an Article 7 vote. Bulgaria also frequently comes up in such discussions. The rule of law issue therefore, can be an increasingly divisive issue between eastern and western Member States (see the figure below). Still, there is also some good news. Viktor Orbán’s goal is to become a significant politician in the European Union, because this would benefit the long-term sustainability and financial sustainability of his regime. Also, it would serve his personal political ambitions the most. The overwhelming support for the Sargentini report shows that this will be rather difficult, to say the least. Additionally, the vote on the Sargentini report can send an important message to other countries (just as the vote on Poland last year), i.e. that not all illiberal adventures remain without political consequences. This can make other Member States more cautious. In summary, it can be said that the vote on the Sargentini report is bad news for the Hungarian government, no news for Hungary as a whole, but good news for the European Union. Orbán openly threatens the EPP and uses the topic of migration as a pretext to gain credit and form new alliances in the EU. He also continues buidling an illiberal state passing a legal and constitutional package which is deadly for democratic institutions. However ignoring Orban only creates a huge wave of democratic backsliding in the EU.